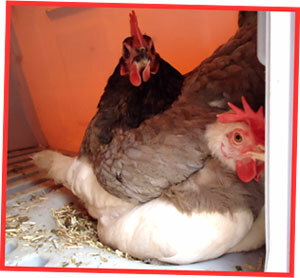 You can tell it’s really cold outside when the hens cuddle up together in the Eglu, and you can’t get much cosier than the hens in this photo! Maria posted this comical pic on the forum, capturing her girls, Snowy and Willow, snuggled up together in the nesting box. It’s very cute, and very funny…but can you think of a caption for this brilliant photo? Send your caption to stephanie@omlet.co.uk by midnight on Sunday and our favourite will win £20 to spend on the Omlet website. Can you write a cracking caption? We are very eggcited to announce that we have almost hit the magic million mark on the Omlet forum. Running since the end of 2004, you have joined in your thousands and chatted chickens like there’s no tomorrow, and there are now over 972,000 posts. This is pretty hentastic news, and we would like to thank you all for helping to build such a brilliant community! We hope you all continue to enjoy using the forum, and if you haven’t checked it out yet why not join? And some other great news, over 1,970 of you have ‘liked’ our Facebook page, which means we are very close to the 2000 point. This is well worth celebrating, so help us reach 2000 and we will give you a 10% discount in return! Click here to ‘like’ us now! Over the years we’ve shared all sorts of egg news with you, and you’ve been happy to send us your facts and photos too. There have been large eggs, coloured eggs, weird eggs, speckled eggs and decorated eggs…so many eggs in fact, you’d think it was Easter! 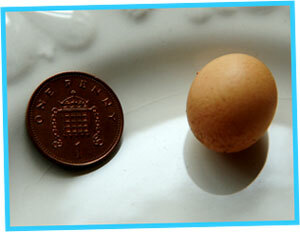 The latest egg to hit our inbox, however, was a teenie tiny egg, possibly the smallest that’s ever been laid! Three year old Winnie the bantam had always laid normal sized eggs previously, but having gone broody she had a few weeks off laying. When owner Anne discovered that Winnie had returned to laying, she was more than surprised to find the teeniest of tiny eggs in the nesting box. The shell, no larger than a penny, encased an egg the size of a 10p piece, with a raised yolk but all white. Not really big enough to be a breakfast in itself, Anne scrambled it with some other, normal sized, eggs. Has your chicken laid an egg to amaze? Send us a photo, we’d love to see!